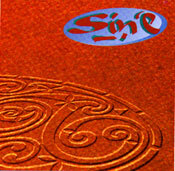 Sin É was formed out of the Irish pub scene around south London, and originally featured Steafan Hannigan (pipes, percussion), Taz (vocal, guitar, bodhran), Mike Cosgrave (guitar, keyboards), Ansuman Biswas (tablas, berimbau, percussion), Teresa Heanue (fiddle) and Francie MacIlduff from the band After Hours on pipes. When the decision was made to 'give it a go', Francie decided to stay with After Hours so the band sought a replacement piper and got two for one in the shape of James O'Grady, who was an all-Ireland fiddler as well as uillean piper par excellance. The first album was a revelation, earning album of the month awards from Mojo and Folk Roots, and the band went on to build a large following on the live circuit. The release of the second album 'It's About Time' saw the band incorporating a more dance feel, especially in the song arragements. The version of 'The Wee Weaver' in particular won massive acclaim for its fusion of Irish and dance, and the album closes with a trance remix of the tune. Following the release, the band acquired new management and, after a couple of line-up changes signed to BMG subsidiary Wicklow Records. The band's debut album for their new label, "Deep Water Drop Off", saw the band veering into a more jazzy feel, but unfortuneately at this point BMG closed the Wicklow label and dropped many of the acts signed to it, including Sin É. The promised international tour support never happened, and after a short tour of the UK to support a record the label was no longer interested in, the band quietly split. However, though they burned for a short time they burned exceedingly brightly, and their albums are destined to become classics of their kind. With six band members there were often clashes, but the different influences and attitudes produced some vibrant and electrifying music. I also have many live recordings that even now can make my hair stand on end!